And Smith has long been determined to prove this point, arguing that equipping law enforcement with the electrical weapons saves lives. But over the years, the company, which Smith founded with his brother in 1993, has adjusted the electrical output of its stun guns, first ratcheting up their electrical charge to 125 microcoulombs of electricity to ensure they would consistently incapacitate a person, and then reducing the charge to about 63 microcoulombs, soon after the electrical pulses proved potentially fatal. It is these current models that emit 63 microcoulombs — the X2 and the X26P — that the San Francisco Police Department will acquire if the Police Commission approves Tasers this year. But, unlike its predecessor, very little research exists on the newest model’s efficacy or record. “It’s a significant concern,” said Alan Schlosser, senior counsel with the American Civil Liberties Union of Northern California, who sat on the city’s working group that helped draft the Taser policy proposal. “Our information from experts says that these new models of Tasers have not been independently tested with a peer-review process,” he said. In June, the San Francisco Police Commission heard a lineup of experts present studies and data on Tasers. But nothing was presented on the latest models, which deliver half the amount of electrical charge as the previous model. Schlosser says that Commander Peter Walsh, the executive sponsor of the working group on use of force, has said that he’s seen data that make him confident in the newer model, but Schlosser has yet to view the studies. The SFPD provided Mission Local with the study that Walsh had reviewed. Prepared by the Royal Military College of Canada, the study tests 30 X2 Tasers and 30 X26p Tasers and finds that the electrical output fell within range of the 63-microcoulomb charge that Axon promises. “The Royal Canada study has nothing to do with efficacy,” said Mike Leonesio, referring to their ability to successfully incapacitate a suspect. Leonesio, who runs an independent consulting firm that specializes in Tasers, said that he knows of no research on the newer models’ efficacy. 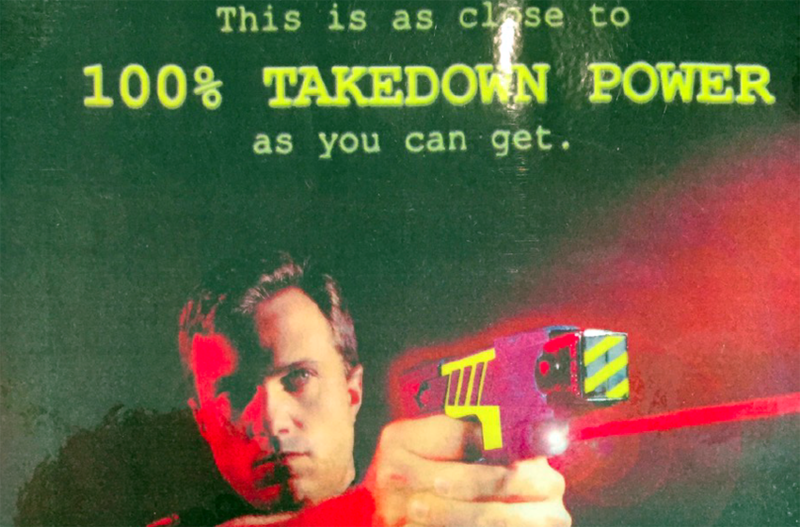 Leonesio established Oakland Police Department’s Taser program, and finds it particularly strange that even the company hasn’t promoted any research on them. “If you look at the history of the company, they’ve always done research and released it as marketing in the lead up to to the weapon’s release and to support the weapon in the course of its life,” said Leonesio. In the past, Axon has released quantified data on the muscular effects of a Taser weapon using the company’s own unit of measurement, “muscle disruption units,” or MDUs. In the first three models of Tasers, the MDU was directly proportionate to the electrical charge of the Taser. But for the newer models, that MDU measurement is nowhere in the company’s published material. “The question for me is: what changed?” said Leonesio. Jeff Ho, Axon’s contracted medical director, has released data on “neuromuscular incapacitation” or the NMI of the new Taser models, but that only refers to how an observer perceives muscular effects. “How do you go from using a term that you invented to sell your weapons, to dropping it and saying that’s not important anymore?” asks Leonesio. Axon did not respond when Mission Local asked why they stopped publishing their data on muscle disruption. Leonesio suspects the company has been less forthcoming on research because the model’s reduced power make them less effective. A 2015 investigation conducted by the Los Angeles Times into the Los Angeles Police Department’s use of the X26P Taser found it had a 47 percent failure rate. Axon spokesperson Steve Tuttle said the Los Angeles Times investigation was flawed. Rather than looking at each incident and whether the Taser ultimately succeeded in gaining compliance from a person, he said, the Times erroneously analyzed each discharge. If the first time an officer fired the weapon it was ineffective, but the second time it worked, the data translates to a 50 percent failure rate. And while Tuttle points to growing sales as proof that police departments are happy with the new product, Leonesio points out they have no choice, as Axon has discontinued the older model. While Leonesio has done no study, he has heard anecdotal evidence that the new model is not as effective. When asked what research supports Axon’s assertion that their weapons can deliver the same amount of electrical force with a reduced electrical charge, Tuttle directed Mission Local to a series of studies, none of which provided conclusions about the efficacy or muscular effects of the newer weapons. Tuttle shared two studies authored by people employed by Axon, neither of which addressed the issue of efficacy or MDU measurements. Instead they discussed the cardiac safety of Tasers. Axon also recommended a study conducted by the British government, which speculates that the lower charge of the new model would decrease muscle incapacitation. About a decade ago, when Leonesio was working with the Oakland Police Department to expand its Taser program, he had the privilege of wide access to Axon’s — then named Taser International — laboratory. Leonesio said he witnessed Axon taking MDU measurements during the early phases of the new circuitry system that is now used for X2 and X26P models. A lawsuit filed against Axon in Houston earlier this year is looking to unearth that data. Former Houston police officer Karen Taylor has sued Axon for misleading and deceptive marketing that failed to alert her to the device’s reduced power. She says she was seriously injured in 2015 when her X2 Taser failed to incapacitate the subject enough so that she could subdue him. In just 14 seconds, Taylor shot her X2 Taser twice and then pressed the Taser’s head, which transmits a lesser charge, into a female assailant, but it never stopped the woman from attacking her. Taylor’s lawyers are now asking the court to compel Axon to disclose their laboratory data on the X2. Leonesio has been asked to provide expert testimony in that case. “We need to look at the underlying data on the circuitry and power that the devices are putting out, and whether it is as effective as the more powerful devices,” Taylor’s lawyer, Fred Shepherd, told Mission Local. An earlier version of this story mis-spelled Mike Leonesio’s name. Our apologies. And in an editing error, a 3 was dropped from the 63 microcoulombs in the second reference to it. Both errors have been corrected.